Aegislash in game: 450 Who? Important notice! 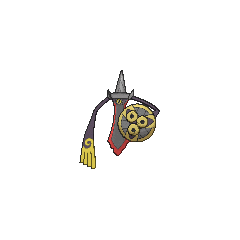 Pokemon Aegislash is a fictional character of humans. 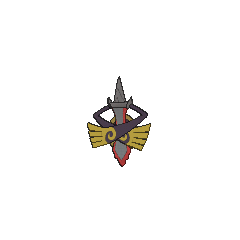 Aegislash (Japanese: ????? Gillguard) is a dual-type Steel/Ghost Pokémon introduced in Generation VI. Aegislash's body is comprised of a golden sword with the blade pointing downwards. The edge of the blade is white and somewhat serrated near the tip. Its single eye, which is purple with a white, linear pupil, sits where the blade meets the hilt, where it is surrounded by black coloration. The handle is thick at its base, tapers as it progresses to the end, and is striated. Two cloth-like arms emerge from the sides of the hilt. Each arm is primarily black and ends in lavender, transitioned by a slight whorl between the two colors. 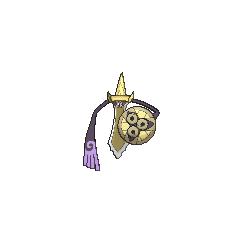 It carries an ornate shield in at least one of its arms. 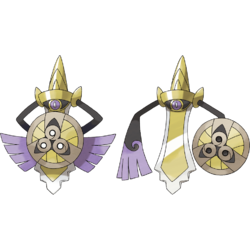 Aegislash made its anime debut in Diancie and the Cocoon of Destruction, under the ownership of Argus Steel. 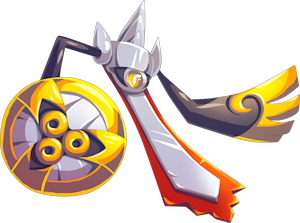 Aegislash made its main series debut in Valuable Experience for All!, under the ownership of Sawyer, where it was revealed to have evolved from a Doublade sometime before the episode. Celosia of Team Flare owns an Aegislash, which she used in conjunction with her Honedge to possess Shauna in Kangaskhan...Kangascan't, which it was in its Shield Forme. It later battled against Korrina's Lucario in both its Shield and Blade Forme in Lucky Lucario Was Here. Later it was used to possess numerous Sky Trainers and later possessed the Vaniville Town residents before they escaped. 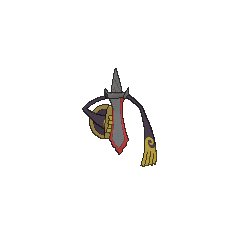 Blade Forme Aegislash has the lowest base Defense stat of all Steel-type Pokémon. 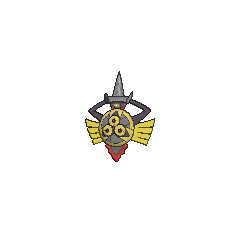 Shield Forme Aegislash has the highest base Special Defense stat of all Ghost-type Pokémon, is tied with Doublade for the highest base Defense stat of all Ghost type Pokéon, and is tied with Registeel and Probopass for the highest base Special Defense stat of all Steel type Pokémon. Gillguard may be a combination of Gilgamesh or gild (to cover with a layer of gold), ?? kiru (to slay with a blade) or kill, and guard.